I would definitely join their Japan tour again. 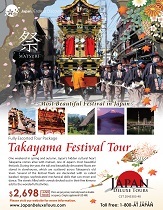 I have just been participating in the 2010 Takayama Spring Festival tour. It was great, the best experience ever. The hotels I was staying at were quite good. Make sure you bring comfortable shoes to wear as there are a lot of walking done during the Takayama festival tour. The tours itinerary were good, we visit plenty of places, though I have to admit that sometimes I did feel a little bit rushed, but it's alright, we visit every places written in the itinerary. They also provide plenty of Japanese cuisine. I would definitely join their Japan tour again next time I'm going to Japan. Great staffs and tour guide as well. The only drawback is that I found they are a little bit slow in replying emails. So the best way to communicate with them is to phone them. Also, if you are interested in places in Tokyo like Shibuya, Harajuku, Akihabara, I would suggest to take an extra day or 2 to explore by yourself. Also, I've heard that Sengakuji Temple in Tokyo is a good place to visit as well (too bad it wasn't in the itinerary). If you like Studio Ghibli, their Studio Ghibli optional tour or anime tour package is a must.